We all know and love Gary’s first e-book Accidentally Self-Employed and now he’s published a new e-book, Living Trust Basics. Simple and easy to read, Living Trust Basics is a must read for EVERYONE! Gary answers some of your most pressing Estate Planning questions and teaches you how to make sure your future, your loved ones and your assets are properly protected in case something happens to you. How do I avoid Probate/Conservatorship? What are Power of Attorneys and do I need them? What is the difference between a trustor and a trustee? How does trust funding work? 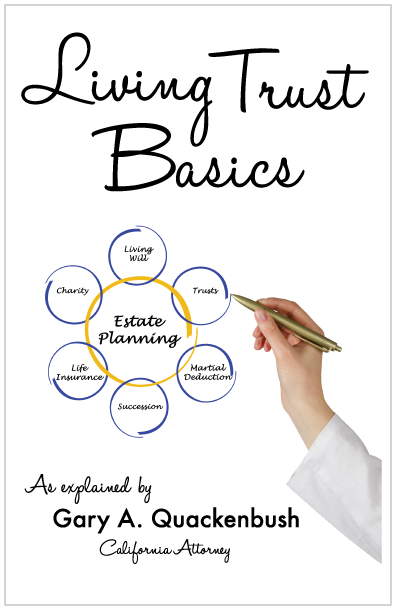 Gary’s goal in writing this e-book is to provide lively, informative, and comprehensive information about personal estate planning. All of us want to avoid death, disability, and taxes. Not one of us can avoid death, but each one of us can minimize the effects of death or disability on our families, and avoid taxes if we know how. The purpose of this ebook is to tell you how. Click on the links above to request your FREE copy today! Also tune in to 1210AM radio in San Diego from 5-6pm tomorrow, Tuesday April 28th, to hear Gary LIVE on the radio talking about his new book. You can also listen live online at www.kprz.com you won’t want to miss it!